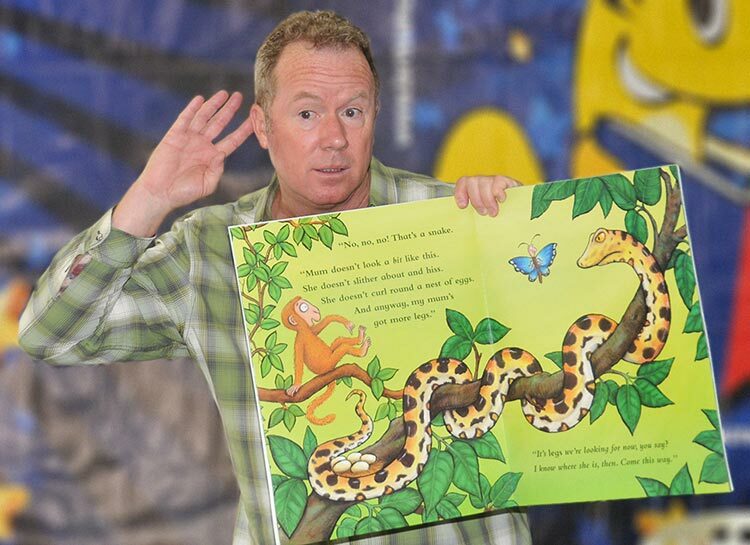 Kevin’s storytelling in schools is about inspiring children to see themselves as storytellers and to experience first-hand the pleasure and power of words. His approach is light-hearted but also rooted firmly in the curriculum. Any school interested in helping children want to write and want to read, will find in Kevin’s storytelling ways of motivating children to tell stories, write stories, read stories. As soon as one of Kevin’s storytelling sessions starts, teachers see straightaway that he is a fellow-teacher with a deep understanding of how to handle classroom dynamics and at the same time bring the curriculum to life. With a subtle balance of high-spirited playfulness and firm control, Kevin takes his workshop participants on unforgettable journeys of discovery. One minute they are laughing fit to burst; the next they are engaged in profound learning experiences. Flowing seamlessly between learning and play, Kevin frames his storytelling as a kind of game - making participants highly receptive to new knowledge and understanding. Within minutes he has them in the palm of his hands. I would recommend Kevin to any school wanting to extend children's skills, confidence and imagination. Kevin brings to children a dynamic blend of words, music, visual stimuli and interaction. He pitches his stories at exactly the right level and always responds positively to children's ideas, building their voices into the story and making them feel valued and involved. He is also a master at managing children's behaviour with great subtlety and kindness. The mix is irresistible and wholly engaging for all. If you are looking for ways to inspire, delight and enchant your children, then look no further than Kevin Graal. As Kevin weaves his magical world around the children, you can actually feel them grow into new levels of perception, understanding and engagement with language. 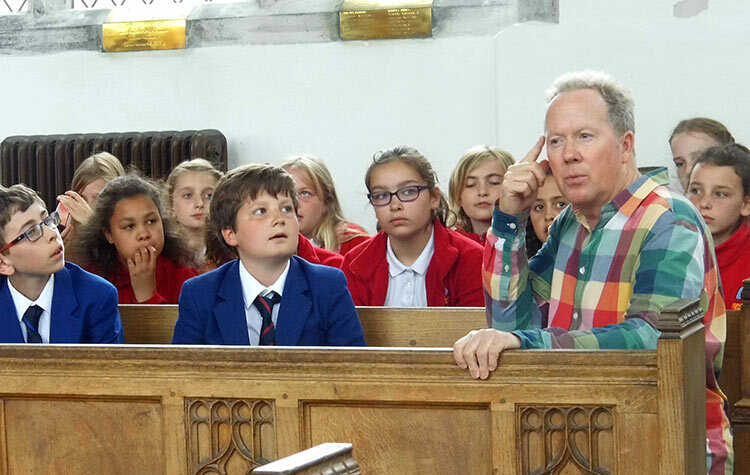 Kevin’s storytelling in schools ranges from one-day visits to two or three-day projects and longer-term residencies. He is happy to work with everyone from nursery to lower secondary, deftly adjusting language and content to suit each year group and always ensuring that learners with English as an additional language or special educational needs and disabilities are fully engaged. In a one-day visit, Kevin can provide a series of performances involving all the children in school or workshops for single classes or a combination of performances and workshops for selected year groups. 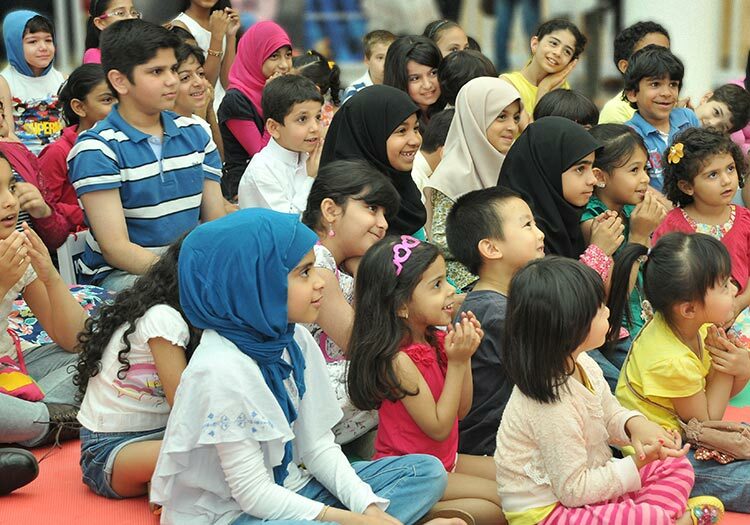 Performances can link directly to specific curriculum topics or particular countries or continents. 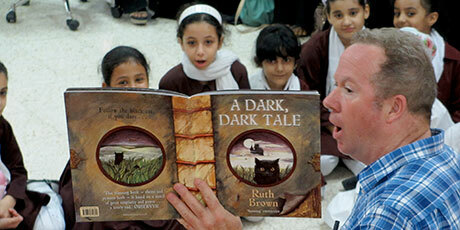 Workshops focus on inspiring and improving children’s storytelling and story-writing skills. Two or three-day projects and longer-term residencies are devised in collaboration with teachers to enrich pupils’ knowledge and understanding of the curriculum, boost self-esteem and develop a range of skills from presenting and performing to teamwork and creativity. We were all so impressed with the creative writing workshops that you ran and the way that you had a whole Year Group of Year 8s eating out of your hand. This is a rare talent indeed. I’ve never seen the children listening so well and so engrossed in a story. 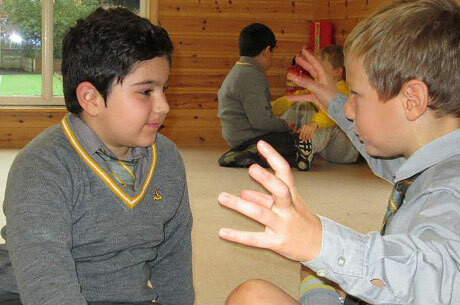 During a one-day visit, Kevin can involve everyone in school with a series of performances weaving together stories, riddles, rhymes, chants, songs and participation with just the right balance to help children maintain focus. 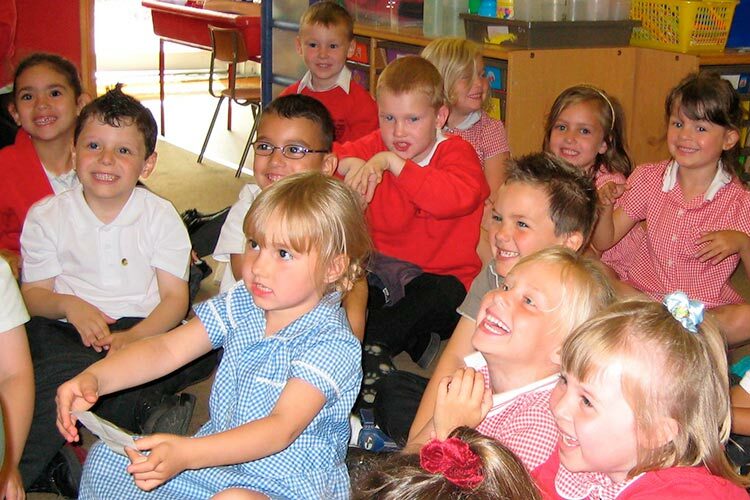 A typical day’s timetable might consist of 20 minute sessions for Nursery and Reception followed by big-group performances of up to 50 minutes each for Years 1 and 2 combined, Years 3 and 4 combined and the same for Years 5 and 6. A really warm feeling of listening and sharing ideas was established and controlled subtly. Kevin’s visit was a very positive experience in creating a whole-school sense of unity and belonging. 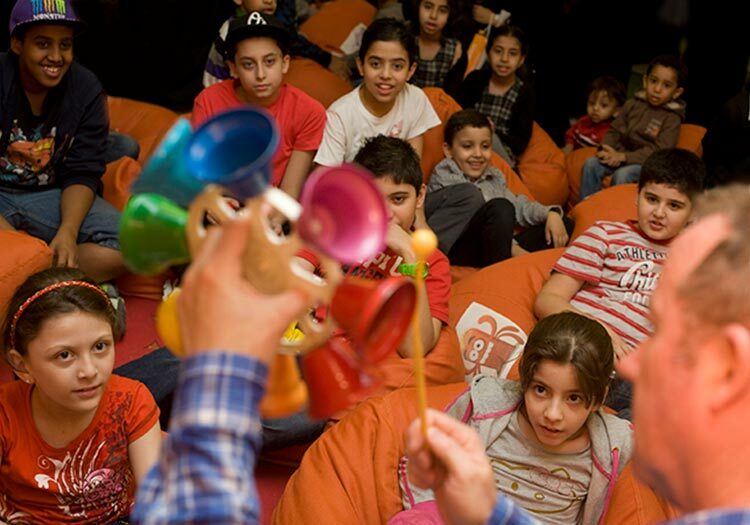 Alternatively, performances for big groups can be combined with single-class workshops. 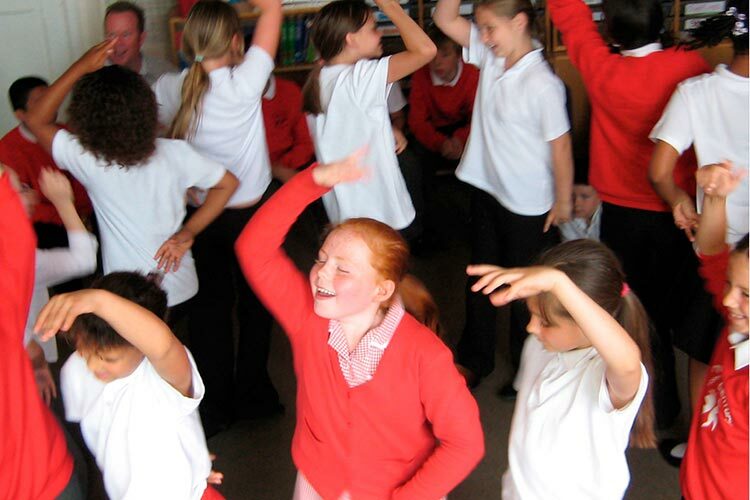 For example, a performance for a whole year group can be followed by workshops for each class in the year group. Kevin is a magical storyteller. Conjuring character and plot out of the listeners, he makes them feel doubly involved in the tale: both telling and listening. Children watch in wonder as the unseen takes shape around them. It is a joy to watch a real enchanter at work. You name the topic and Kevin can bring it alive with stories! 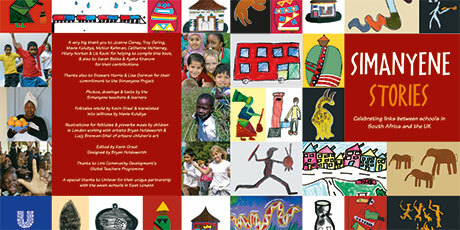 An interactive celebration of stories, songs, rhymes and games from around the world. A captivating combination of favourite and lesser-known fairy tales from the world's oral traditions. Stories about feelings and human behaviour from Aesop’s moral tales and Panchatantra, the ancient Indian cycle of tales-within-tales. A fun-filled celebration of the beauty, humour and power of words. A medley of powerful myths from ancient Mesopotamia, Egypt, Greece and North America. Kevin was able to pitch his performances to suit each age and interest level from Nursery age to Year 6. He was also able to fully engage the EAL students (over half the school!) by celebrating their home languages and drawing them into his very visual performances. Whether working with everyone in school, whole year groups or entire Key Stages and whether providing curriculum-linked performances or ready-made shows, Kevin’s storytelling in schools is full of fun but also seriously educational. It is an inspiration for teachers and pupils alike. The storytelling was incredible! We had worked with a storyteller before but this time it was more interesting. We learnt different ways to tell stories - funny ways like riddles and little rhymes, and we learnt some brilliant songs based on the languages we speak at home! Kevin is no small part a reason for us achieving our best ever English results. He is very approachable and the children love him to bits. He is a real master in managing the children and getting the best out of them, and a wonderful storyteller - and more! 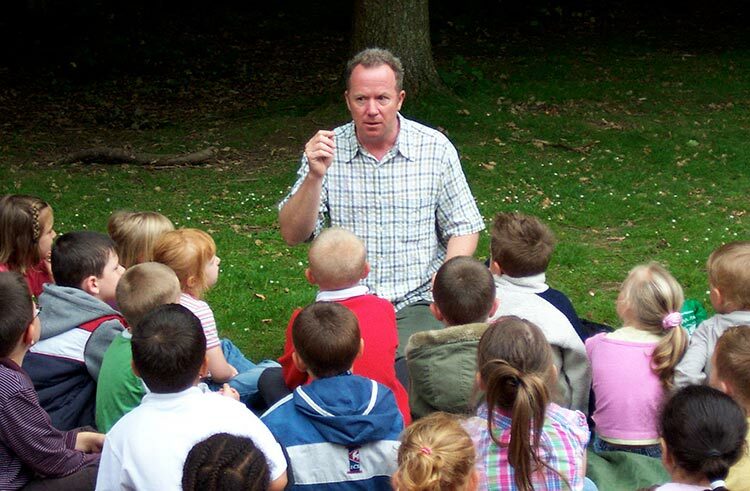 Kevin’s fun-filled workshops for single classes are designed to develop children’s speaking and listening skills, inspire and improve their story-writing and foster a lasting enthusiasm for stories. The underlying aim is to motivate children to see themselves as storytellers and to WANT to write and tell their own stories. Kevin’s storytelling and story-writing workshops are playful but highly structured: introducing new ideas in carefully graded stages, providing clear frameworks, pitching tasks at exactly the right level of understanding and always reinforcing turn-taking and teamwork. There is also a rich stream of visual imagery on the whiteboard with slide-shows, word-banks and writing scaffolds together with photocopied templates and resources. The sheer excitement and joy I have seen in the children’s faces and watching Kevin’s way with children has been absolutely inspirational! Kevin’s workshops address curriculum topics and literacy goals but are also about helping children and young people to find their voices; enabling them to articulate their curiosity about the world and to express their responses to it; fostering the confidence to ask incisive questions and the critical skills to formulate thoughtful answers; above all, nurturing the core skills which will help children to learn - decision-making, problem-solving, empathy, risk-taking, critical judgement, discussion, negotiation and, last but not least, creativity! The focus here is on the building blocks of storytelling and story-writing - sharpening children’s understanding of the basic parts of speech, enriching their descriptive language around character and setting, tapping into their enthusiasm for predicting story outcomes and improving their grasp of story sequencing through picture-making games and simple writing tasks. These workshops explore story structure using storymaps, storyboards and storywheels as well as storytelling games and role-play exercises on characterisation, extending vocabulary, establishing point of view, evoking atmosphere and story-writing based on patterns found in traditional tales. The children are finishing off their stories as we speak - it has really inspired some of my not-so-keen writers to actually get something of quality in their books. As well as focusing on traditional tales, Kevin is happy to respond to requests for workshops on books by contemporary children’s authors. Here Kevin explores links between famous literary texts and lesser-known stories from the world’s oral traditions - giving children (and their teachers!) fresh insights and new perspectives. Kevin can also focus on children’s classics like Alice’s Adventures in Wonderland by Lewis Carroll, The Twits by Roald Dahl and the stories Shakespeare tells in plays such as Macbeth, The Tempest and A Midsummer Night’s Dream. Whatever story you'd like to explore, Kevin can help bring it to life! Kevin’s skill and charisma as a storyteller and musician enthralled the children and empowered the teachers. The positive impact of the project on the children’s speaking and listening skills and on the content and quality of the children’s writing is clear. 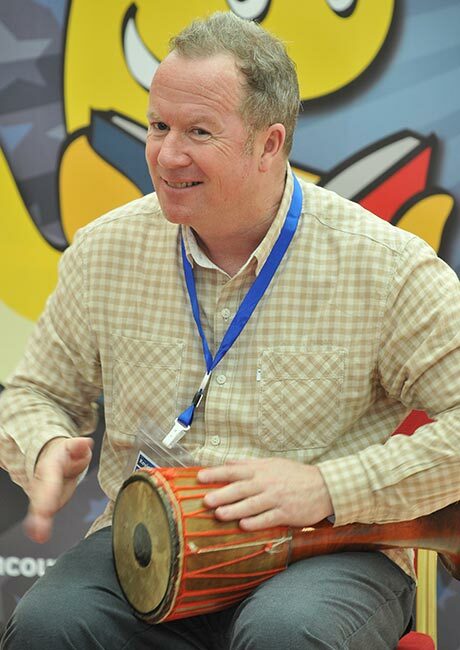 Kevin has a 30 year track-record of delivering inspirational projects and residencies in UK schools and around the world: from learning outside the classroom in a Sussex woodland to storytelling with English Language teachers and learners in Saudi Arabian schools; from developing playful approaches to the teaching of phonics to inspiring and motivating reluctant writers through story-making games and role-playing exercises. Kevin’s tailor-made storytelling projects in schools are linked to the curriculum and take place over 2 to 3 consecutive days. Longer-term residencies usually involve weekly visits and extend over an entire school term. Both projects and residencies are planned in collaboration with teachers and are designed to enrich pupils’ knowledge and understanding of the curriculum but also to boost their skills and confidence as presenters and performers of their own work. If you have an idea for a storytelling project in your school or are interested in a residency, just get in touch! Starting with remembering and imagining what it was like to be a baby - using photos as a prompt - then moving on to describing ourselves in the present and imagining ourselves in the future, this project devised for KS1 explores the theme of growth and change through speaking and listening exercises and picture-making. 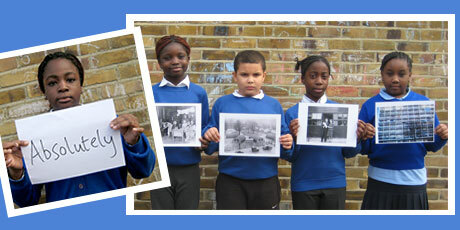 Working with children in a South London school to investigate photos, historical documents and oral histories recording the life of ordinary people during World War II. The project culminated in an exhibition of photos and creative writing at the Imperial War Museum, London. 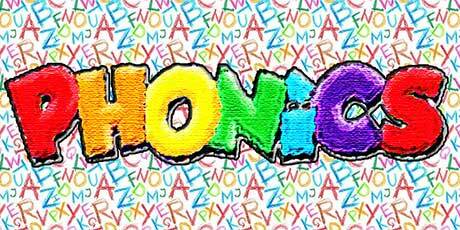 Using nursery rhymes, playground songs and nonsense poems to develop resources around playful approaches to the teaching of phonics at KS1 as part of a long-term residency in an East Sussex primary school. 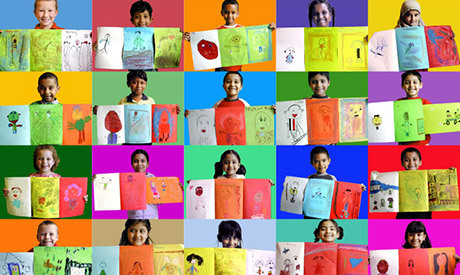 Working with 6 East London schools to produce a book of creative writing, photographs and artworks created by children and their teachers in London and the Eastern Cape of South Africa as part a series of exchange visits sponsored by Unilever. 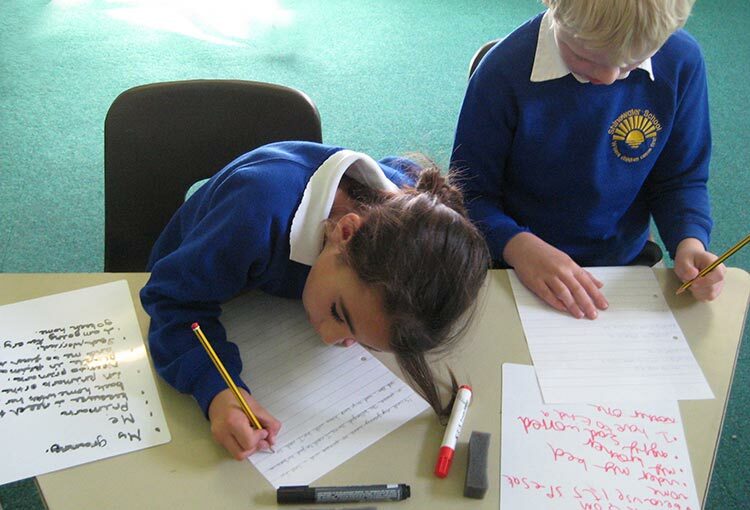 Intensive input in 4 Surrey Primary Schools - 2 days in each school - working with targeted KS2 classes and gifted and able groups to improve descriptive language in their story-writing and to develop a deeper understanding of story structure and characterisation. Storytelling presentations for schools in Saudi Arabia, Bahrain, Kuwait, Qatar, Oman, Algeria, Jordan and the Palestinian Territories as part of Kids Read, a British Council sponsored programme encouraging children to read for pleasure. A joyful learning experience for everybody - students and teachers alike! !